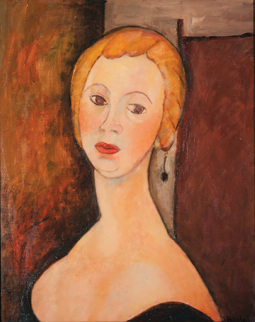 Though highly individualized, unique and completely her own work, you can't help but notice the influence of Modigliani in Terenia's portrait style. The elongated necks and faces, rich dark lines, are all classic Modigliani. Some portraits mirror this style more than others, but there is certainly no denying Modigliani's influence on Terenia's painting style. Her inspiration and painting subjects come from, not only friends and family, but also people she meets during her travels or throughout the course of her everyday life. Terenia paints from memory and by feel, you'll rarely, if ever see her using a model. Whether pauper or poet, millionaire or shop keeper, you never know who will debut in her portraits next.